Today during Apple's September 9th Special Event Keynote, Apple officially unveiled the widely rumored iPad Pro. Apple's new iPad features a huge 12.9-inch Retina display, their new A9X chip, a four-speaker architecture, an 8 MP iSight Camera, support for the also-announced Apple Pencil and Smart Keyboard, and much more. To quote Tim Cook, it's "the biggest news in iPad since iPad." Of course the most obvious feature of the iPad Pro is that incredible 12.9-inch Retina display. The display clocks in at 2732-by-2048 pixels, a resolution of 264 pixels per inch. That's about 5.6 million pixels, even more than the 15-inch MacBook Pro's Retina display, and an incredible 78% larger than the iPad Air 2's display. The resolution of this display was strategically chosen so that the width of the iPad Pro has the same number of pixels as there are in the height of the iPad Air line of displays. This means you can run two full-height iPad Air apps side by side in Split View mode on the iPad Pro when it is in landscape orientation 1. In order to drive the massive amount of pixels on the iPad Pro's display, Apple described a number of new technologies being used under the hood. An advanced process called "photo alignment" uses UV light to more uniformly distribute the liquid crystal molecules of the display, making sure they are positioned exactly where they should be. According to Apple, this creates higher contrast when looking directly at the display. Apple also adapted to the iPad Pro the same oxide thin film transistor ("Oxide TFT") that they use in the displays of their iMac Retina 5Ks. This allows for faster pixel charging and more even brightness across the large display. The timing controller for the display has been redesigned as well to allow rapid pixel control of all 5.6 million pixels at once. 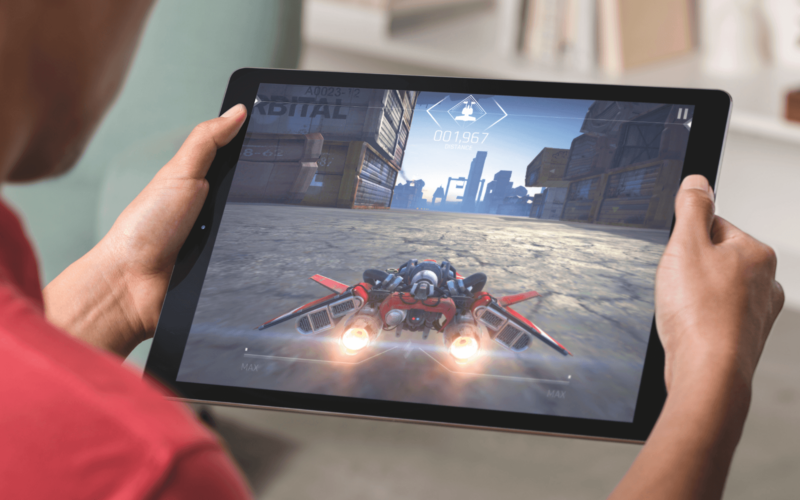 Finally, the iPad Pro is the first of any of Apple's devices to introduce a variable refresh rate for its display. The refresh rate is how many times the display reloads all of its pixels every second in order to make the pictures appear to move seamlessly and without latency. With the new variable refresh rate, the iPad Pro keeps track of when content on the screen is not moving (and thus does not need to be refreshed as often) and cuts the display's refresh rate in half (from 60 times per second to 30) during these intervals. This makes the screen more energy efficient, preserving battery life. In the Jony Ive narrated iPad Pro introduction video, Ive states that the variable refresh rate "leads to greater efficiency and the all day battery life you would expect." This is great, but I hope it does not imply that using apps which require the full refresh rate all all day long will result in significantly worse battery life. We'll have to wait for reviews to come out to know for sure. For the first time in any iOS device, Apple is finally taking a greater interest in speaker quality. The iPad Pro features a four speaker system to produce a stereo soundstage around the device's display. The four speakers have 61% more back volume, a wider frequency range, and three times more output than previous iPad models. 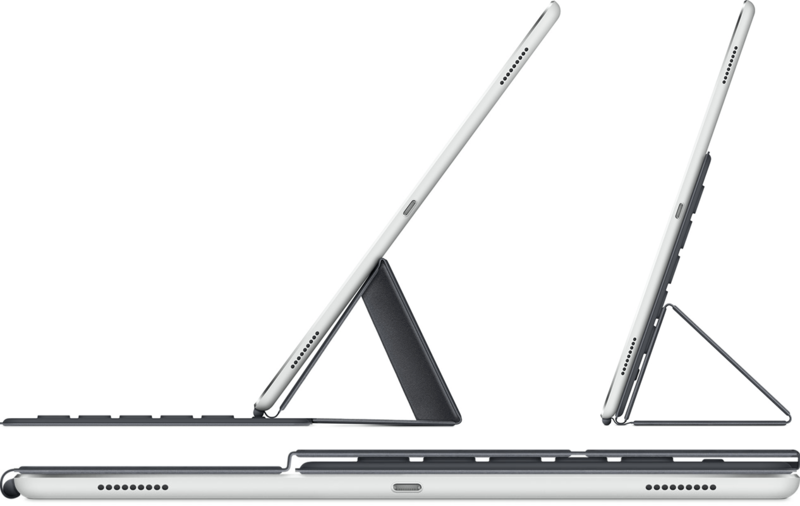 The system also adjusts based on the orientation of the device, so no matter how you may be holding the iPad Pro, the speakers will adjust to balance frequencies between left and right, and top and bottom. Under the hood, the iPad Pro runs on Apple's brand new A9X chip. This 64-bit chip now has the M9 motion coprocessor integrated inside (previously this was a separate chip in itself), and delivers 1.8x faster CPU performance and 2x faster GPU performance over the iPad Air 2. In fact, the A9X is able to process data so quickly that Apple had to develop a new storage controller which delivers better performance than some desktop computers. That means that opening huge files, including 4K movies and RAW images, happens super quickly on the iPad Pro. During the keynote, Apple bragged that the iPad Pro CPU is faster than 80% of portable PC's CPUs, and the GPU is faster than 90% of portable PC's GPUs. And with all of this power, Apple still reports that the iPad Pro will have the classic iPad 10-hour battery life. For measurements, the iPad Pro is just 6.9 mm thin, and weighs in at 1.57 pounds. In contrast, the iPad Air 2 is 6.1 mm thin, and weighs 0.96 pounds. During the keynote, Apple pointed out that the first generation iPad weighed 1.54 pounds, despite being a much smaller screen size. The iPad Pro also features an 8 MP iSight camera on the back, which is capable of recording 1080p HD video at 30 frames per second. On the front you'll find a 1.2 MP FaceTime HD camera. While the iPad Pro has reportedly made some great improvements to the accuracy of tracking on its multi-touch display, the device sadly will not include the new 3D Touch features of the iPhone 6S and 6S Plus lines. The most likely explanation we can come up with for this is that Apple was unable to adjust the new technology to work well on the huge screen size of the iPad Pro. Perhaps they'll have it ready for next year's model. "The only thing we didn’t reinvent was the alphabet." Along with the iPad Pro, Apple also announced a new accessory device that they are calling the Smart Keyboard. The Smart Keyboard attaches to the iPad Pro magnetically, similarly to how Smart Covers have always attached to iPads. Rather than using Bluetooth like most third-party iPad keyboards that exist today, the Smart Keyboard connects to the iPad Pro via a new connector built into the side of the iPad, called the "Smart Connector" 2. The magnetic attachment lines the Smart Keyboard up perfectly with the Smart Connector each time, so you never need to worry about plugging and unplugging the Smart Keyboard. The Keyboard never needs to be charged, either. The Smart Connector delivers power from the iPad Pro to the Keyboard, and relays keystrokes from the keyboard to the iPad Pro. The Smart Connector's direct integration also allows the software on the iPad to seamlessly transition when it knows a Smart Keyboard is attached. Here's a quick picture of the three different folds that the keyboard can be set up in. When typing, three sections fold to create the classic triangular prop up behind the iPad and the keyboard extends out in front. If you want the keyboard out of the way, you can fold it a different way to put the keyboard in the back of the iPad. Finally, when you aren't using the device, the keyboard settles on top without taking up much extra space. Some other nice aspects of the Smart Keyboard: the surface is formed from a single sheet of an Apple custom-woven fabric, and comes in at only 4 mm thin. The fabric forms the structure of the keys too, which each contain an Apple Dome switch inside. Furthermore, the Smart Keyboard has a water- and stain-resistant finish. Apple didn't mention anything about the iPad Pro itself being water resistant, so I would still try to avoid knocking over drinks near the device. Along with the Smart Keyboard, Apple will also have its usual lines of Smart Covers and Silicone Cases, now iPad Pro sized. Interestingly, Apple will also be allowing third-parties to create keyboards that integrate with the Smart Connector. 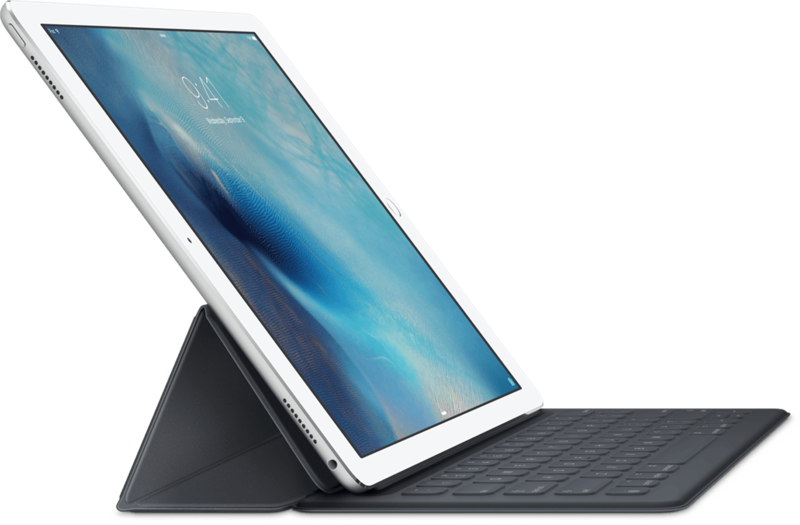 In fact, Logitech was given access to the iPad Pro ahead of time, and already has a keyboard designed and ready to ship in November. The final iPad Pro-related announcement of the day was the Apple Pencil. For drawing and illustrating on the iPad, this new device (sold separately) could be a game changer. The iPad Pro senses when the Apple Pencil is being used rather than a finger, and starts scanning the system for input at 240 times per second, twice as fast as the iPad Air 2 scans. The result: almost no latency between moving the Pencil around the screen and your input being drawn. Highly responsive sensors in the tip of the Pencil also allow it to precisely track pressure, orientation, and angle as you move the Pencil across the screen. In response, apps can make lines thinner or thicker, apply shading when the pencil is angled, and more. The Pencil can be used simultaneously with touch input from your fingers as well. In Apple's keynote example of this feature, a users hands positioned the software ruler in the Notes app while the pencil drew along the side, resulting in a perfectly straight line drawn in the exact right position. Cleverly, the Apple Pencil has a Lightning connector built right into its base. Pop off the cap and plug the Pencil into an iPad Pro to charge it. The Pencil can last for up to 12 hours of use from a full charge. Amazingly though, a mere 15 seconds of charging will reported give the Pencil 30 minutes of battery life. The iPad Pro will be available in November with three pricing tiers. A 32 GB Wi-Fi model will have the line's starting price of $799. From there, the 128 GB Wi-Fi model will come in at $949. Finally, the 128 GB Wi-Fi + Cellular model will be $1079. All models are available in Silver, Gold, and Space Gray aluminum finishes. The Smart Keyboard will be available in November for $169. No word on the pricing for the iPad Pro's Smart Covers or Silicon Cases, but presumably they will be at least as expensive as the iPad Air equivalents, which go for $39 (cover) and $79 (case). The Apple Pencil will be available in November for $99. 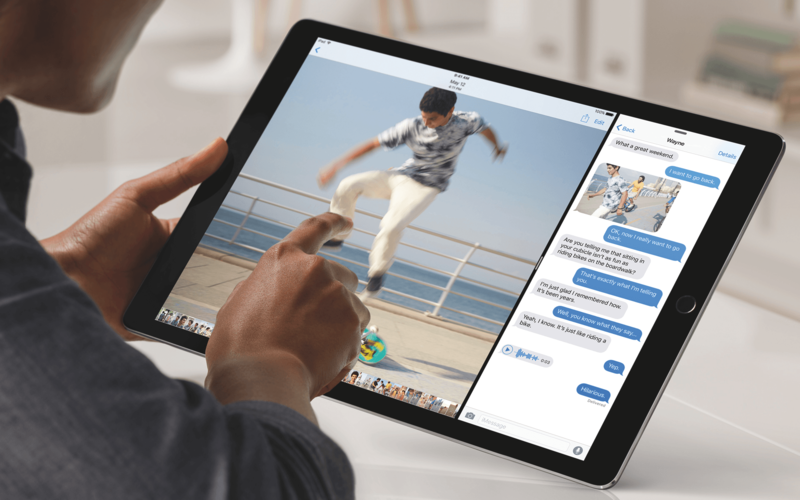 Continuing the trend started last year by the incredibly powerful iPad Air 2, with the iPad Pro Apple has once again shown that it truly believes in the iPad product line, and will continue to produce innovation within it. The iPad Pro is the most powerful iPad to date, delivering truly "desktop-class" performance built on top of the iOS operating system. Perhaps the iPad Pro will be enough to finally put an end, once and for all, to the ridiculous "iPad isn't for work" mantra. And with the new Smart Keyboard and Apple Pencil, Apple is expanding the iPad's use cases to make it even more compelling to the enterprise and to artists. You can also follow all of the MacStories coverage of today's Apple's keynote through our September 9 Keynote hub, or subscribe to the dedicated September 9 Keynote RSS feed.